The ROJ TV trial in Denmark resumed at Copenhagen Municipal Court on Wednesday. The Court revoked the license of all satellite channels of Mesopotamia Broadcasting, including MMC, NUCE TV and ROJ TV. Three Kurdish channels were also punished by a pecuniary penalty of five million DKR. Speaking about the court’s decision, journalist Amed Dicle said lawyers of the company would soon object to the decision. Dicle said the prosecutor of the court also asked the closure of the broadcast company and remarked that the court a kind of approved the prosecutor’s demand by imposing such a high pecuniary penalty. Dicle said today’s court decision is much heavier than that ruled in 2012, reminding that the channel’s assets have already been suspended and that it has been facing some other obstacles for some time now. Journalist Dicle remarked that during the trial the court also made positive assessments about the ongoing process in search of a Kurdish question. He noted hat the pecuniary penalty the court punished was the highest one ever imposed on a media institution in the country. The trial against Roj TV began on 15 August 2011 after the counsel for the prosecution demanded the closure and dispossession of the Kurdish satellite channel. Copenhagen Municipial Court rejected the demand for the disclosure, ruling that there is no legal ground for the revocation of the channel’s license and the seizure of channel’s assets of EUR 20 million. Charging the Kurdish channel with making propaganda for the PKK (Kurdistan Workers’ Party), the court punished Roj TV A/S and Mesopotamia Broadcasting A/S by a pecuniary penalty on the grounds of violating the anti-terror law of Denmark. The license of the channel was however not revoked. 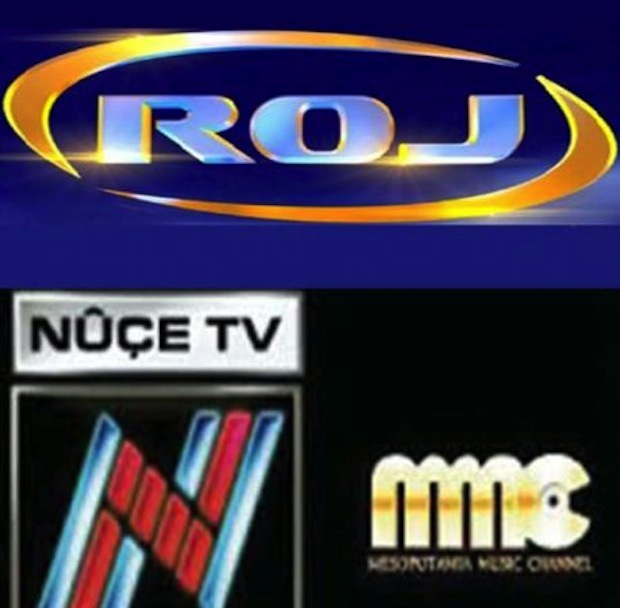 Roj Tv was born as Med Tv on 30 March 1995. On 14 April of that year it broadcast the founding congress of the Kurdish Parliament in exile. Over the years in the four parts of the divided Kurdistan (Iran, Turkey, Iraq and Syria) as well as all over the world the satellite dishes grew like mushrooms to receive the precious signal which was coming from Europe to give the Kurds everywhere images and voices of their country. Med Tv was broadcasting from Belgium and soon Turkish pressures convinced the local authorities to act against the television. In September 1996 with a massive police operation Med Tv is raided, its staff detained, archives seized. In February 1997 the MGK (Turkish National Security Council) asks once again for the closure of Med Tv. But is after the arrest of the Kurdish leader, Abdullah Ocalan, that things turn for the worst for the television. On 22 March 1999, a month after the capture (as a result of an international plot) of Ocalan in Kenya, the English ITC revokes the license and Med Tv cannot broadcast anymore. But the Kurds don’t accept this abuse and open a new television channel, Medya Tv, this time in France. It does not go too well, but a new license is obtained by CTV based in the Vatican. And after a short period it is Denmark that give the new licence. The Kurdish channel begins broadcasting once again, first with the name Mesopotamia Tv and then with the name Roj Tv. Roj Tv has a very various programming, from news, to in depth investigation programs, from live music programs to live debates. It broadcasts in Kurdish (Sorani, Kurmanci and Zazaki) as well as in Turkish. Roj Tv is always under attack and pressure since its foundation on 1 March 2004. From the Turkish state to begin with, but also from the United States, which have often act on behalf of the Turkish requests (and pressures) to an often embarrassed and embarrassing silent Europe. The requests are of course for the “immediate closure” of Roj Tv. In 2005 it was the Turkish premier Recep Tayyip Erdogan who, at a press conference in Denmark with his Danish counterpart, suddenly left the room when he saw among the crowd of journalists two Roj Tv reporters. “There is room only for one of us: if they don’t leave I will”, said an angry Erdogan. And it was him who had to leave the room, after the polite but firm reply by the Danish authorities, “For us freedom of the press is a value to respect and to uphold. We will not censor any journalist”. In other words, sorry Prime Minister, but it’s you who should go. And Erdogan did leave, but he has been holding a grudge against the Danish government since. Turkey sent Danish judiciary 26 files against Roj TV in 2010.